This Summer Has Flown By! Kids are back in school, there’s a crisp chill in the air and Fall Sewing Classes are about to be back in session! But first… a recap of the summer! I had a wonderful summer, and I hope you did too! (It was a little hot for me, personally, but I made it through just fine). I’ve been very busy this summer spending time with family. 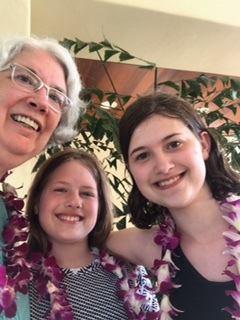 In June, my sister Tonya came to visit with her son Skylar and their Japanese foreign exchange student. We went to Kah-Nee-Ta Resort & Spa in Warm Springs for a fun day of swimming before heading up to my daughter’s house in Tacoma, Washington. They live right on the water in Puget Sound, so it was a very fun and relaxing time! From there we went kayaking and hiking, and then went to the zoo in Gig Harbor. We had so much fun! 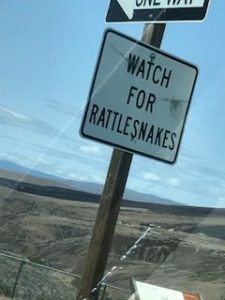 Then I was off to Idaho through Washington, where I stayed with my mom for a week. It was so good to see her and to have quality time together. Afterward I went back to my sister’s house to help her prepare for her son Brandon’s wedding. (For all who are wondering, my time with my sister is usually like this – we fit A LOT of activities in a short amount of time!). 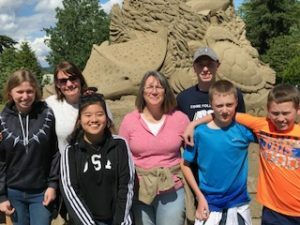 Here’s a few pictures from the Gig Harbor Zoo, Tacoma, and driving across Washington to Idaho. Overall, it was an excellent and fun-filled summer. Now I’m back in town and am eagerly getting ready for my upcoming Fall Sewing Classes to start. I’m so excited to see all my students again! 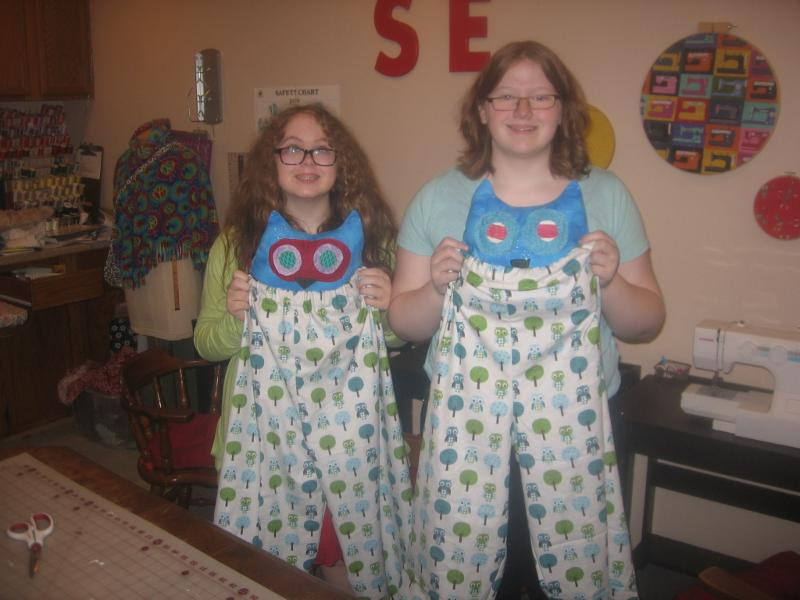 This year’s Summer Sewing Camps began on June 18th and lasted through August 22nd. I held 18 camps in total, so my students and I kept very busy! I love sewing camps – they are so much fun and it is such a delight to see my students learn, grow and improve their sewing skills week after week. Here are some pictures of a few of the camps. I’ll make sure to do a few Facebook posts about them so everyone can see the fun we had! (You can follow me on Facebook by clicking here). My upcoming Fall Sewing Classes begin on Tuesday, September 4th. There are still plenty of spots left, so check out my website right here for availability! Next summer (June 2019 to be exact) is my 10-Year Anniversary! To celebrate, I’ve decided to dedicate these next 10 months (including September) to celebration. Each month will have something new and exciting to offer… and it’s all leading up to my Big Anniversary Bash! There’s a lot of exciting things happening in the next 10 months – and a lot of preparations for my 10th Anniversary Party! Make sure to watch the website and follow me on Facebook for details! 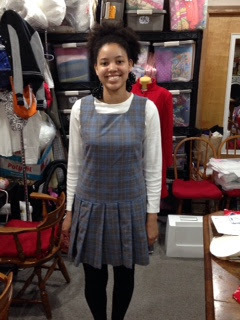 This stylish apron was my student Olivia’s very last project of the year. 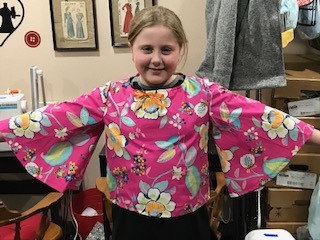 She ended up bringing her own pattern to class, and the final product ended up looking great! I love her fabric choice, and the bright green bias tape she used really makes the fabric pop. Great job, Olivia! I’m looking forward to seeing you all again this fall! Make sure to sign up for classes ASAP to reserve your spot! I Can’t Believe It’s May! I can’t believe it’s May already – that means it’s time to start thinking about summer sewing classes! Spring is definitely a time of renewal for me as school winds down, spring flowers come forth, and gardens get planted one by one. The world around us is transformed, and I feel transformed along with it. I love it! Speaking of growth and transformation, June 2018 marks the 9th year of JoLene’s Sewing School! I can’t believe I’ve been teaching kids and adults how to sew for nine whole years – the time has just flown by! A BIG THANK YOU to all of you for helping me make my dreams come true! 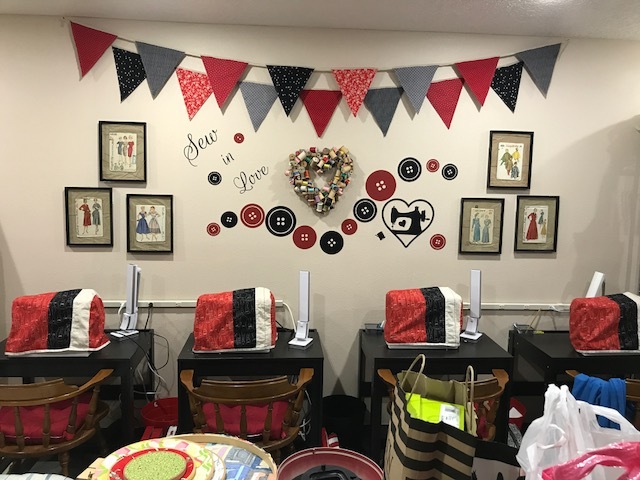 I love teaching every one of you, and I look forward to helping both my current students and my new friends learn to sew in the upcoming years! As this school year comes to a close, I look back with fond memories of all my kids, parents, and adult sewers. You’ve all experienced many great achievements over the past nine years, and I am so proud of everything you’ve all accomplished! Last Day of Spring Classes: The last day of spring sewing classes is May 25th. Make-up Classes: If you need to make up any classes, please contact me. JoLene’s Vacation: I will be taking a vacation from May 26th – June 16th. I will have no classes during this time. This is a time of renewal for me, as well as a time for cleaning, preparing for camps, and time away with family. I hope you enjoy this break, too, and come back refreshed! Summer Adult Classes: My Summer Adult Classes will begin on June 18th. These will be at the same days and times as normal. Summer Kids Weekly Classes. I will have Hourly Summer Kids Classes between June 21st – August 23rd on Thursdays from 9:00 am – 10:00 am, as well as any time between 1:00 pm – 5:00 pm. Please give me a call and let me know what time works best for you. After School Classes: My After School Classes will begin September 4th. Sign up now to hold your spot! Exciting News: My 10th Anniversary Party! In June 2018 I’ll be celebrating 9 years of owning Jolene’s Sewing School. And, while this is very exciting, it got me thinking… why not start preparing now for next year’s BIG 10th Anniversary Celebration!!! From September 2018 – June 2019 Jolene’s Sewing School will have 10 full months of celebration. And it’s all leading up to my BIG 10th ANNIVERSARY PARTY!!! There will be events, prizes, and more leading up to the Big 10th Anniversary Bash. And all of you are invited to celebrate! Keep your eyes peeled for more information! Summer camps begin June 18th and my final summer camp begins August 20th. I am doing 18 summer camps total this year. I try to do a good variety of camps, from clothing to stuffed animals. Pick your favorite camp and sign up quickly, as spots are limited! July 2, 3, 5: Animal Stuffy Camp (9:00 am – 12:00 pm) *Note this camp is Monday, Tuesday and Thursday because of the 4th of July holiday. July 2, 3, 5: Summer Dress For You & Your Doll Camp (1:00 pm – 4:00 pm) *Note this camp is Monday, Tuesday and Thursday because of the 4th of July holiday. Announcing The Best Student Of The Quarter: Summer! Look at this wonderful shirt that Summer made! I love her choice of fabric. It’s a vintage pattern that she’s bringing back with style. The neck was a little tall originally, and so she took out the facing, cut it down a bit, and put it back in. Now it’s perfect!!! 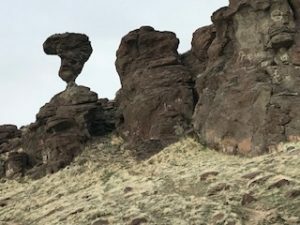 For spring vacation, I went to Idaho and took care of my mom. I visit her when I can, and help out so that my sisters can have some time off. I enjoy going, as it’s always quiet there and relaxing. While I’m in Idaho I always do lots of snuggling with my mom, and make sure to fix her favorite foods. This time I made green pepper steak and chili rellenos. Yum! While I was there, I was also able to wish my sister Donna a happy birthday. 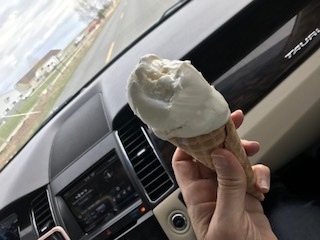 Then, my sister Tonya took me “the back way” to her home in Mountain Home through the city of Buhl, where we stopped and got homemade licorice ice cream. I managed to get a picture of it before it was all gone! I also spent Easter with my sister, where we colored Easter eggs and played games. I made them my famous German pancakes for breakfast (they were so good I ate them before I could get a picture!). Finally, I left early Monday morning to get back home. I love my family, and love spending time with them. I hope each of you have been able to get in some good family time, too! I’m looking forward to seeing all of you in the summer! What a great summer we’ve had here – these past few months have been filled with wonderful classes and even MORE wonderful students! We had a ton of great summer camps going on this summer. However, the most popular was Emoji Camp – we had 14 participants for this camp alone! 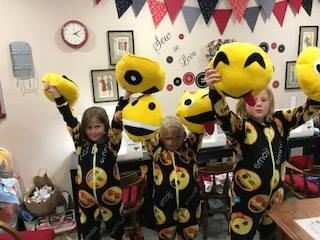 The kids had a great time sewing their own Emoji pillows and footy pajamas out of Emoji fabric. We even made Rice Krispy treats for snack, and decorated them with our favorite Emoji faces! Everyone had a blast, and I’m excited to be doing more of these camps moving forward. Want to know about more of the classes I’ve offered this summer? Be sure to Like and Follow my Facebook page, where you can keep up with class updates and other information. Click this link to visit my page. I truly enjoyed all of my students this summer! However, there is one that stood out in particular. Cerra is 13 years old, and this her second year attending my camps. Each year, she flies to Oregon all the way from Hawaii in order to see her family and take my sewing classes! This year, she participated in Around The World Camp, where she had fun sewing her own french berét, french skirt, stuffed panda bear, and bag that says “Hello” in 13 different languages. It was a joy having her in class, and an honor to have her come all the way out here to see me. I’m looking forward to seeing you again! Fall sewing classes have officially begun! My one-hour Children’s Classes are being held Mondays – Fridays at 3:15pm, 4:15pm, and 5:15pm. There are still plenty of spots open for those of you who have not signed up yet. Please click this link to view all class availability and information. Are you adult who would love to learn to sew? My Adult Classes are lots of fun, and you’ll leave knowing all the basics you need to sew your own clothing, accessories, and more! There’s still a few spots left if you’d like to sign up. To view up-to-date availability for my Adult Classes, please click this link. You can also call me at (503) 804 -7259 for questions or to set up an appointment. Exciting News: I Have A “New” Sewing Studio! As some of you know, my sewing studio recently got a huge makeover! With help from my sister and some friends, we transformed my old studio into a work of art. I love it! Want to learn more about the studio, and stay up-to-date with what’s going on with Jolene’s Sewing School? Click here to read my blog! I have a new blog up every month with sewing school updates and fun sewing tips. I’m looking forward to seeing you all as we head into Fall! If you have any questions, please let me know. The summer camps have been a lot of fun so far; here’s an example! While many folks out in the world are busy finding Pokémon with their phones, my students are making their own Pokémon bags, pillows, and even hoodies. There are a few open spots in these last weeks of summer camps. See details below, and check out links to recent blogs on my website. Fall classes are just around the corner! There are a few more summer camps left this year! If your favorite camp is full or is scheduled on a week you can’t attend, please contact me and I will work something out. Camps are Monday, Tuesday, and Wednesday; either 9am – 12 noon or 1pm – 4pm. Register on the website or by contacting me. #13 9-12 Stuffy! Make three stuffed animals from soft fabric and take home to cuddle or share with a friend or family member. All supplies provided: $130. #14 1-4 Hoodie! What fun to make and wear a hoodie you made yourself. We will also make mittens, a hat, and more as time allows. Patterns provided. Supply list given at time of registration: $110. #15 9-12 Circle Skirt & Cotton Tee. Come make a very up-to-date version of the circle skirt in three colors with a top to match. Great for summer or school. Patterns provided. Supply list given at time of registration: $120. #16 1-4 Back to School. Make a poncho, a messenger bag, and notebook cover (notebook provided), just in time for school. Patterns provided. Supply list given at time of registration: $120. #17 9-12 Warrior Cat. Do you love cats and/or love to read the Warrior Cat books? If so you will love this camp. Make a sweet cat bag, stuffed cat, cat tee, and more as time allows. All supplies provided: $130. #18 1-4 Hunger Games. Make a skirt on fire, mocking jay backpack, and tee shirt. All supplies provided: $130. Remember, you can register on the website or by contacting me. Once again, if your favorite camp is full or is scheduled on a week you can’t attend, please contact me and I will work something out. 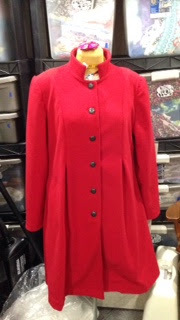 New Wool Coat: I have been making my own coats and jackets when they wear out, and I really love this one I made. It has a paisley liner! You can read about ithere. Personalizing these projects, and making them fit just right is such a pleasure. What projects would you like to see come off your cutting table and through your sewing machine? 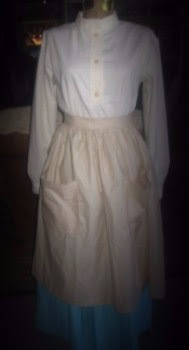 Pioneer Fashions: Last summer my granddaughter Madison had the chance to participate in a pioneer trek in Washington state. She needed pioneer clothing for her trip, and did a wonderful job on her projects, with only a little bit of help on something tricky. See more picture and read all about it here! As a reminder, the weekly classes will begin again on September 12. You can find more information on my website. Hi to everyone! What a great spring we have had. 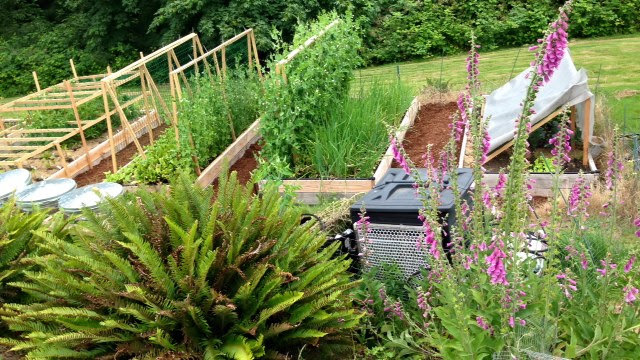 I am happy to have my garden planted and am already harvesting radishes and lettuces, with peas on the way. Eating produce from the garden is a delightful part of summertime. Right now I am in the middle of my two week vacation, and am having a lot of fun with my husband and grandkids. I’m also getting ready for my upcoming summer camps and am very excited. I really enjoy these camps and have a great lineup for you! Not to worry if you have not signed up yet; there are plenty of spots left, but they are filling fast, so don’t wait too long! If your favorite camp is full or is scheduled on a week you can’t attend, pleasecontact me and I will work something out. Camps start June 20th and go through to the third week of August. Most camps are Monday, Tuesday, and Wednesday (except for week of 7/4); either 9am – 12 noon or 1pm – 4pm. Register on the website or by contacting me. #1 9-12 Who’s Hooting. Come make everything owls!! 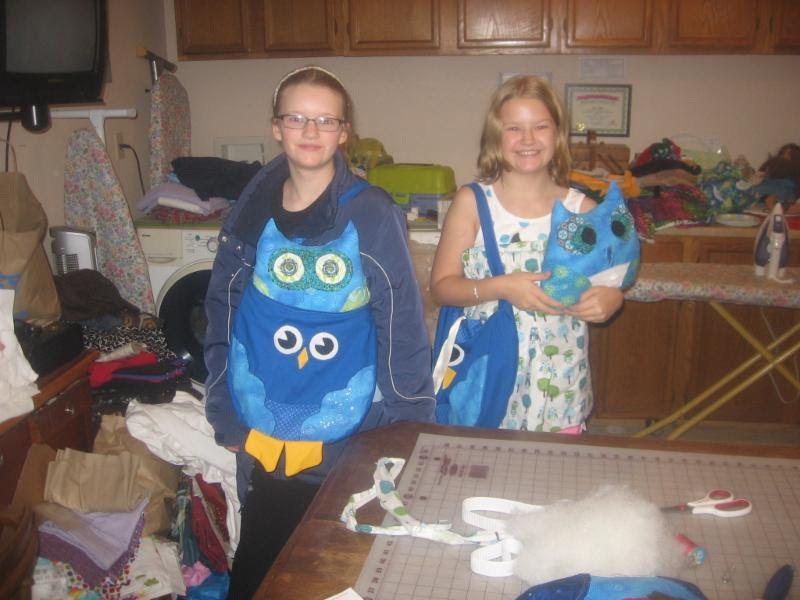 Make a super cute owl bag, owl pillow, owl pajama pants, and more as time allows. All supplies included: $130. #2 1-4 Dress a Doll. Make a wardrobe for your 18-inch doll (3 to 5 clothing items). Bring the doll with you; we will be having a tea party with our dolls each day. All supplies included: $130. 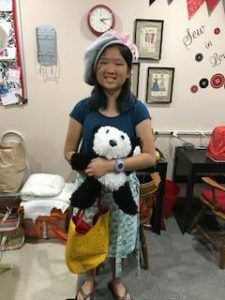 #3 9-12 Dress a Doll. Make a wardrobe for your 18-inch doll (3 to 5 clothing items). Bring the doll with you; we will be having a tea party with our dolls each day. All supplies included: $130. #4 1-4 Summer Dress for You & Your Doll. Come make a summer dress for you and your doll that you can enjoy all summer. We will be having a tea party with our dolls each day. Pattern included. Supply list at time of registration. $110. #5 9-12 Art Kit Organizer. Come make bag and art kit organizer for all your art supplies! All supplies included: $130. #6 1-4 Bedroom Makeover. Come make monster pajama eaters, laundry bag, pillowcase, flower pillow, and more as time allows. All supplies provided: $130. #7 9-12 Fun at the Beach Love the beach, sand, sun, and waves? Make a bag that turns into a beach towel with pillow, cover up, and beach bag. Towel and pattern provided. Supply list at time of registration: $130. #8 1-4 Sock Monkey. Make an old-fashioned sock monkey made from brown, pink, or blue socks with a red heel. We will be making a variety of sizes. All supplies included: $130. #9 9-12 Everything Fox. Inspired by the song “What Does a Fox Say,” come make a cute fox bag, fox scarf, and more as time allows. All supplies provided: $130. #10 1-4 Pokemon. 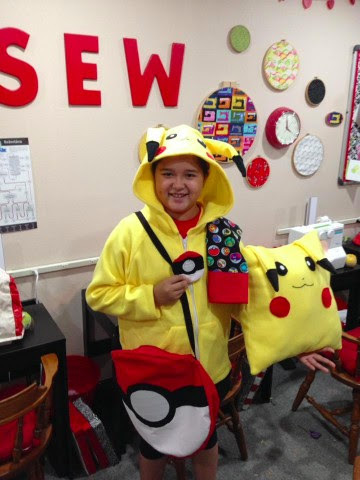 Come make a Pikacku hoodie, poke-ball bag, and poke-ball pillow. All supplies provided: $130. #11 9-12 Kitty Cat Quilt. Come make the cutest cat quilt ever! Curl up with a good book on a cool winter day. I supply the quilt top fabric. Supply list given at time of registration: $120. #12 1-4 Star Wars. Come make Jedi robe (either the light side or the dark side), a Chewbacca pillow, and Star Wars pillowcase. All supplies provided: $130. Remember, you can register on the website or by contacting me. And if your favorite camp is full or is scheduled on a week you can’t attend, please contact me and I will work something out. This is Amber and she loves plaid. This dress she made had a simple skirt but she changed it up and made a knife-pleated skirt instead. 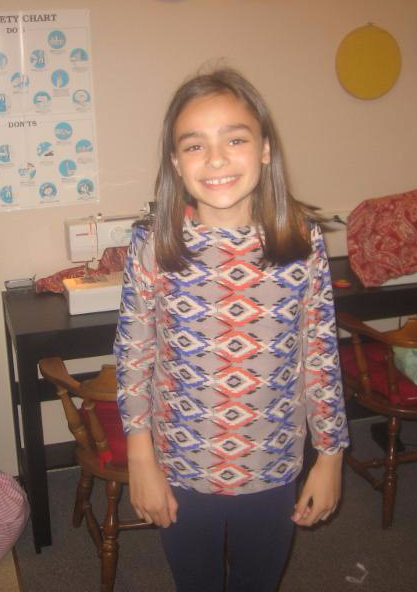 She already knew how to sew when she started taking lessons, and her sewing skills have really improved. Congratulations, Amber! Keep up the great sewing projects.. . . When starting a new project, always make sure you have the right needle. I use universal needles most of the time, which can be used for both woven and knit fabrics. If your thread or needle keep breaking, do your research. You may need a specialty needle! Good luck on all of your sewing adventures. Hello! Spring has sprung early and it is glorious to watch everything come alive. I’ve been enjoying my new flowers and lovely weather, and I also enjoy the rain. A recent windstorm took out part of our big tree in the back yard, but it luckily just missed hitting our trampoline! There are only two months left of after-school classes, but there is a lot happening during these last two months! See below for more information, and all my best for your spring showers and flowers! The Multnomah County Fair is a highlight of my sewing school’s annual events, and I’ve been talking to students about it for the last month or so. 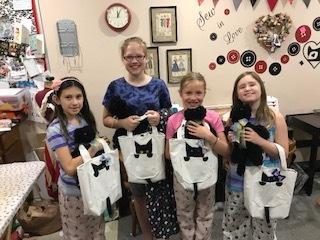 Just knowing that they might enter a fair where a judge will look at their project helps them to pay more attention to detail and become more skilled in their sewing. The benefit of careful work is one of the most important part of participating, whether or not they win a prize (but is a bonus if it happens!). Fair will be May 23 – 25th, 2015, from noon to 7:00 PM each day, at Oaks Park in the Sellwood Area. Admission and parking are both free. Entrants may submit one Item per lot (one shirt or one dress, etc. ), with a maximum of four items. (If you want to enter them yourself rather than going through me, you can enter more.) You don’t have to be present to win or enter, so even if you’ll be out of town you can submit items for entry. Logistics: I will take all the entries to the fair on May 21st and will pick them up on May 25. For entries that I submit on your behalf, you must have my permission to pick up items from the fair yourself. Fair officials won’t let you take them unless I give the okay. Also, the fair won’t release any items before 7:00 PM. I will bring the entries to my house and give it to you the week after the fair. This year’s fashion show will be held at my home studio and will include a picnic! Mark your calendars for June 20, from 4:00 – 7:00 PM. The fashion show will be held first with the picnic following, about 5:00 PM. For the picnic, I will provide hamburger, hot dogs, buns, condiments, and beverage. I am asking that each family bring a salad or dessert to share. Each child can model two outfits. They need not match. Each outfit can include as many items as you wish. For instance, a student can wear shorts and a sport shirt while carrying a bag or stuffed animal that they made. 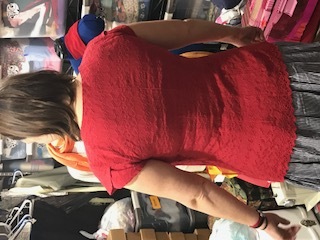 Students can wear something they did not make, such as wanting to model a top but did not make pants. Please have your child wear their first modeling outfit and bring their second outfit to change into. This will be a great gathering! Please sign up with me the items that you child is modeling and what food items you are bringing. We will have this rain or shine; outside for sun and inside for rain! May 29 is the last day of after school classes. I take off the first two weeks of June for vacation, so there will be no classes during this time. The sewing camps held over spring vacation were great! Both camps were full and we had so much fun. Who’s Hooting Camp is always a favorite and this time was no different. 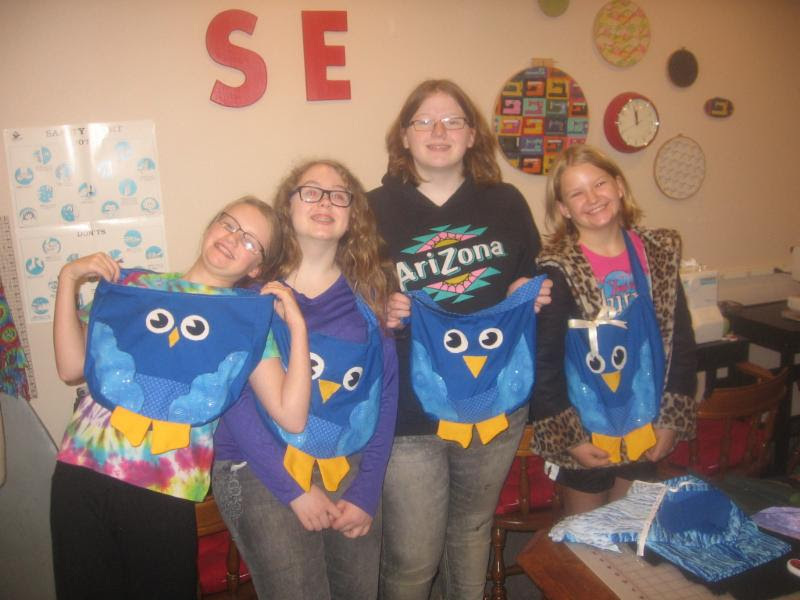 We made owl bags, owl pillows, and pajama pants. 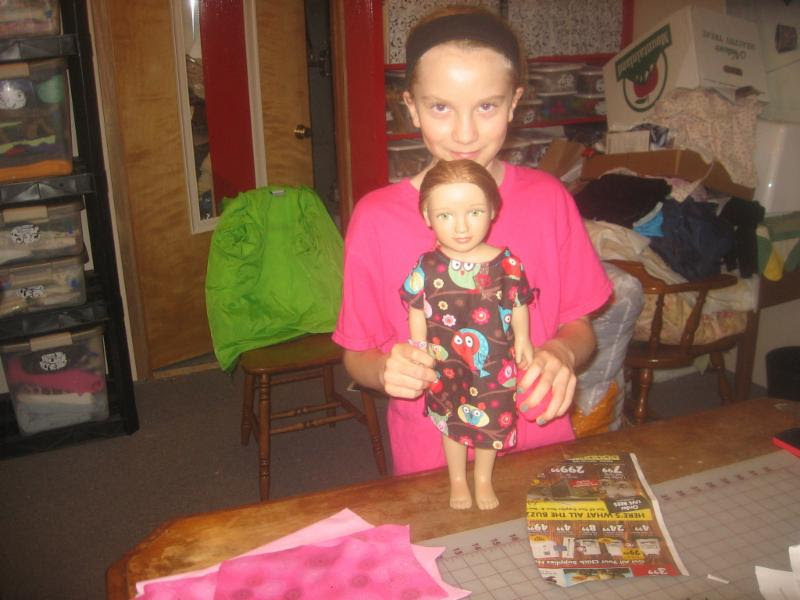 One girl made a nightgown with a matching one for her doll. In the Sewing Supply Camp we made scissor holders. pin cushions, sewing bags, and donut pillows. Sign Up For Summer Camps! Camps start the June 15th and go through to the third week of August. All camps are Monday, Tuesday and Wednesday, either 9:00 am – 12:00 PM, or 1:00 – 4:00 PM. 9-12 and 1-4 Giving to Others Camp. CAMP IS FREE! For more information see my website. Reinforce your seams by back stitching at the beginning and end of each seam. Start by sewing forward only a few stitches then back stitch all the way to the edge. Then sew to the end of the seam and then back stitch again and sew off the edge. This keep the seams together and makes it easier to sew the next step. Check out this adorable long-sleeved shirt made by a 9-year-old girl in my school. I love the way the orange pattern goes down the middle of the front of the shirt, and the blue pattern goes down the sleeves. The neck facing is perfect, too. She did a wonderful job! We are so happy how it turned out. Greetings! Welcome to the December 2014 Newsletter for JoLene’s Sewing School! Hello! I hope this newsletter finds you enjoying the beautiful autumn we have been having and that you are happily in the middle of a sewing project! I am very fond of the fall, the weather changing, and anticipating holiday time with family. I had my mother and sister Tonya and family here for Thanksgiving, which was delightful. A lot has happened since my last newsletter I would love to catch you up! At the end of May my students and I entered the Multhomah County Fair. There’s so much I just love the fair, including watching the faces of my students as they enter their submissions and receive the ribbons. Twelve students entered with a total of 36 entries. They received six first place, five second place, four third place, and the rest received participation ribbons. Sariah received the overall Best of Show for the Youngest Child ribbon on her vest. This was a great way to end a year of sewing, and a great event to anticipate in May 2015! The last weekend of May included the Sewing School’s annual fashion show at Courtyard Plaza retirement home in SE Portland. With the beautiful weather, we held it outside in their lovely courtyard. With eight students participating, we were small in numbers but it was a great success. Parents and residents alike had a great time and enjoyed the children modeling their creations, and the students have the marvelous opportunity to share the fruits of their labors. 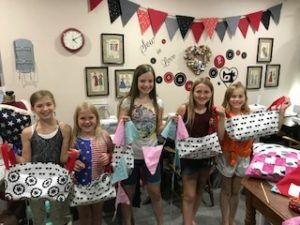 JoLene’s Sewing School Celebrated Its Fifth Anniversary! We celebrated five excellent years of JoLene’s Sewing School on the 21st of June. It was well attended, and fifteen of my family members came from all over the Northwest, including my mother. We had great food, a fantastic day of celebration, and fun and prizes. We’re looking forward to the next five years! 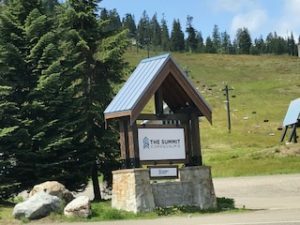 Besides all that you have read so far, with the fair and fashion show and anniversary party, I also had twenty camp offerings this summer! As always, they were great fun and produced some fantastic projects. In addition, this summer my computer died. That was difficult, since I do a lot of business on the computer, but I bought a new machine and I just love it. As with so many things, having the right tools can make all the difference! Due to enrollment, I ended up canceling my last camp and started a remodel on my bathroom. This was a major endeavor! I will do a future blog post on all the things I am sewing for it. I’m taking a deep breath and looking ahead to the next set of scheduled camps and next year’s events! Come and make gifts for your friends and family! Each three-hour workshop includes all new gifts to make this year and a meal snack. There are 35 gift projects to choose from, and are appropriate for a wide range of ages, both male and female. All materials for this workshop are provided, and students will create the gifts during the workshop and bring them home that day. There is nothing like giving a handmade gift, and these workshops help make it easy to do so! Come make two cute stuffed moose, including one with a red nose! Keep both or give one to family or friend. $90, all supplies included. Inspired by the song “What does the fox say?” we will make a cute fox bag and scarf. $90, all supplies included. You pick your fabric and have a wonderful warm and cute hoodie to keep you warm all year long on those cool Oregon days. $65, includes pattern. Supply list provided at time of registration. Come make everything owl! A stuffed owl, bag, pillow case, and nightshirt. $130, all supplies included. Come make a sewing bag to hold your sewing supplies. It’s adorable and has many pockets. Pick form several options for pincushions, covers for sewing scissors, and many other options as time allows. $130, all supplies included. Put these dates on your calendar! More information to come. Pressing is a very important part of sewing. Each time you sew, whether it be seams, darts or hems, pressing gives your project a professional and finished look. A good ironing before you start to sew and after you are done is also a must! Every year I try to do an event to make items to give away to those in need. This year’s giving event was held over three days with sixteen attending, plus two additional volunteers each day. We made 38 pillowcases, which we donated to the Dougy Center. We also made 39 warm hats and 16 scarves for those without homes, plus 10 teddy bears for the police department. Thank you to all who participated and who helped make this world a bit better! Greetings! Welcome to the May 2014 Newsletter for JoLene’s Sewing School! Once again the end of the year comes way too fast! It feels like yesterday that leaves were starting to change and the September after school classes were just starting. And now all of a sudden here we are already with blooming trees in May. This is the best time of the year! We have the fair, the fashion show, my fifth anniversary party, and the beginning of the summer camps. Here we go with all the info! The Multnomah County Fair is fast approaching, and will be held May 24, 25, and 26 at Oaks Park. Admission and parking are free, and the fair is open daily from noon to 7:00 PM. All entries for the fair need to be to me by 9:00 PM on May 22, and I will deliver them to the fair at 11:00 AM on Friday the 23rd. The entries are judged Friday night and Saturday morning and are displayed before the fair opens at noon on the 24th. Contact me for entry forms, rules, and lot numbers. Only one item per lot (one shirt, one pair of pants, etc). Everyone is a winner, and I encourage all my students to enter the fair. It is a wonderful experience! The Fashion show is May 31th from 1:00 – 2:00PM. The show is held at Courtyard Plaza at 60th and Division In SE Portland. This is a hugely popular event as the kids enjoy showing off their wonderful creations. Each student models two outfits. They don’t need to match. Pleasecontact me for the form for what your child is going to wear and return it to me. Please arrive at lease 15 minutes before starting time, wearing the first outfit. I start right on time so try not to be late. Three volunteers needed for the event. 1- Door person tells the kids when to go out and model. (This person can see the whole show). 2- Music person plays music from their phone or iPod with speakers (I have speakers if you don’t). 3- Photographer to take photos of the kids as they model.Just let me know if you are interested in a volunteer position! This takes place rain or shine. Courtyard Plaza has a beautiful outside area with a fountain, but if the weather is cold or raining we will have it in their Mt. Hood room. Looking forward to seeing you there! JoLene’s Sewing School Is Celebrating Its Fifth Anniversary! To mark the occasion and milestone, we’ll be having a big party! We hope that you will come and celebrate with us. June 21st 4:00 – 7:00 PM. Bring friends, family, neighbors – anyone that might be interested. The last day of after school class before Summer Camps is May 30th. I take the first two weeks of June as my vacation. This year I have twenty summer camps! There is a great variety and something to appeal to everyone. The first camp starts on June 16th and the last camp starts on August 18th. Come and bring a friend! Note that if your friend has not sewn with me before they need to take the free preclass before the camp. See the website for camp details and availability. Don’t wait too long to sign up as they fill up fast! Tip of the Month: Beeswax to the Rescue! Doing hand sewing such as putting on a button or repairing a hole can sometimes be frustrating if the thread gets tangled and forms a knot. Simple solution: Beeswax. Just run your thread through beeswax, which coats the thread and keeps it from tangling. Beeswax can make you life a bit easier! As we approach this busy end of year time, don’t miss out on registering for a camp! You cancontact me for questions or registration. Greetings! Welcome to the April 2014 Newsletter for JoLene’s Sewing School! I love Spring. The daffodils, tulips, and even dandelions are so beautiful against the bright green grass. Take a stroll through a fabric store this time of the year and all the new spring fabrics just pop out in bright yellows, pinks, and greens, loudly proclaiming spring! 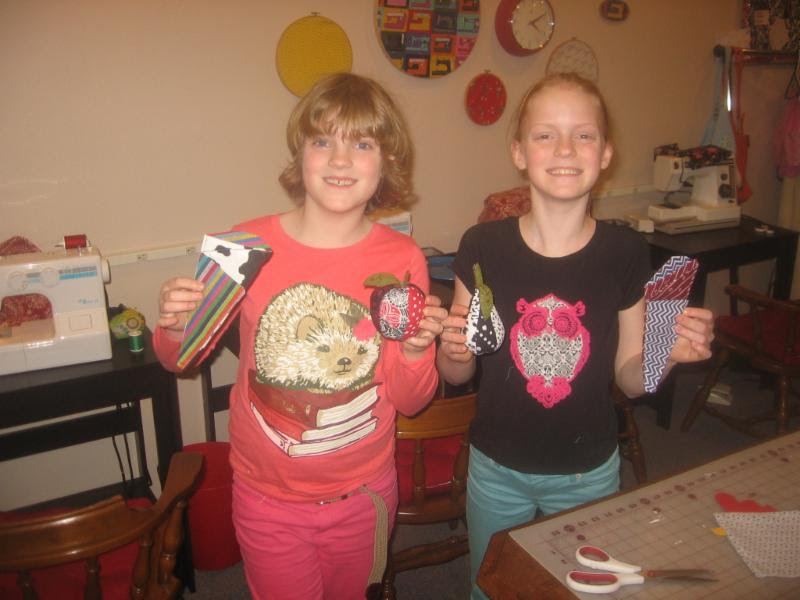 Spring brings thoughts of the Multnomah County Fair and the fashion show and a little bit of sadness as the end of the schoolyear brings the end of after-school sewing classes until Fall. But there is also joy as Summer is just around the corner and a series of camps begin. 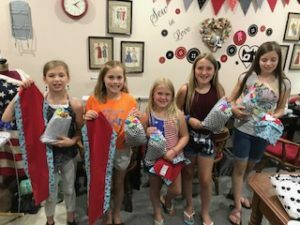 Camps are a different kind of sewing, and the opportunity for new friends, creative summertime outlets, and fun different projects. Summer camps ensure a fun time to be had by all – me included! The Multnomah County Fair is fast approaching, and we are working on our fair entries now. I find sewing entries for the fair helps the kids to pay more attention to detail and improve their sewing skills. The fair will be held May 24, 25, and 26 at Oaks Park. Admission and parking are free, and there are plenty of fun exhibits and rides to enjoy. The fair is open from noon to 7:00 PM daily. All entries for the fair need to be to me by 9:00 PM on May 22, and I deliver them to the fair at 11:00 AM on Friday the 23rd. The entries are judged Friday night and Saturday morning and are displayed before the fair opens at noon on the 24th. Go on the fair website http://www.multnomahcountyfair.org and look at the exhibitor’s handbook and see what else you might want to enter. Maybe you are a cookie baker or a artist? You might want to enter in those categories! The sky is the limit. See you at the fair! And don’t forget to get your entires to me by May 22. The annual fashion show is the last activity of the year. Everyone in the school is invited to come and show off what they have made this year. Each child can model two outfits. The show is held at Courtyard Plaza at 60th and Division in SE Portland and every year has been a wonderful experience. It is a retirement community and the residents so enjoy having us come share our accomplishments in sewing. Save the date! May the 30th from 1:00 – 2:00 PM. If it is nice weather we will be out side in their courtyard; if the weather is cold we will be in the lovely Mt. Hood Room. The last day of class before Summer Camps is May 30th. A big part of the summer for all kids are summer camps. I try to make a variety of offerings that will appeal to everyone. See the website for more details. Don’t wait too long to sign up as they fill up fast! We will be making a variety of items to be donated to a family homeless shelter. Some items made will be hats, pillowcases, warm socks, plush animals, scarves, etc. Eight kids per camp. This camp is FREE! Must commit to all 3 days. This is my daughter Stephanie’s project. She wanted to make a dragon quilt for her 5 year old son for Christmas. She made up her own pattern and bought the fabric, and I helped her figure out how to sew it so she received the desired affect. I love the fabric she chose and how she put the dragon head and feet on. She wants to put a spine down the quilt from the head to the bottom with a tail off the quilt. Love the soft minky fabric on the back and the body part. Fabulous job, Stephanie! Keep an assortment of extra notions like thread, snaps, elastic, bias tape, and zippers. You never know when you need some, and having extras will save you heartache and a trip to the store at closing time. As spring blossoms, don’t miss out on registering for a camp! You can contact me for questions or registration. Christmas is a wonderful time of the year. I love the music, lights, Santa at the mall, the chill in the air (even better if it snows; hint hint: please snow! ), making Christmas cookies, and making gifts for friends and family. This year my Christmas was spectacular. Last year my daughter made a new rule that we all had to make presents for each other instead of buying things. Here’s a sample of some of the gifts from the heart. It was so fun to help my four grandkids make things for each other. My granddaughter Hallie’s gift for her grandfather was the best. She made a 2×4 out of wood print fabric. Isn’t it sweet?! There is nothing like getting a homemade gift that was made just for you. In Oregon spring comes quickly after Christmas. I try to get my cold weather crops in my garden by the end of February. To help us get ready for the up-and-coming season, here are my winter and early spring camps. There are some fun options; take a peek! One of the Christmas camps was Sock Monkey PJ’s. It was so much fun! Sock monkeys have made a resurgence and the kids just love making them. The PJ’s are so cute, and I was excited that I found fabric that looked just like sock fabric, a printed flannel. I found a picture of them in a catalog and made my own pattern for the hood and footsies. 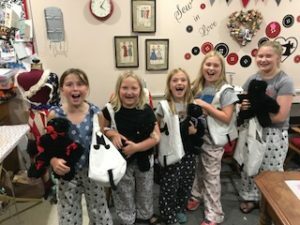 The Christmas camps are a ton of fun, and I’m repeating the Sock Monkey PJ camp in March. Join us and make some Sock Monkey PJ’s of your own! When making changes to a pattern, it is a good idea to a practice one out of old sheet or muslin to make sure it works before you make the real project. That is what I did for the sock monkey hoodie and footsies. Then I made changes bigger or smaller or adjust the pattern until I am happy with the result. As the wintertime begins to give way to early spring, don’t miss out on registering for a class or a workshop! You can contact me for questions or registration.